A distressed finish with moderate color variation and a slightly textured surface. Add a little character to your home beyond textured and painted walls. This tuscan plaster finish gives you an old world textured wall finish using acrylic plaster techniques. A color wash adds a natural color variation more subtle than sponge painting or rag painting. 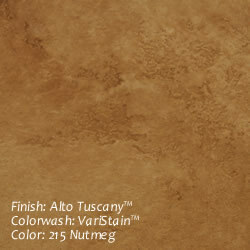 Apply the first coat of Alto™ using random, decorative trowel strokes. Avoid using straight trowel strokes as each stroke plays a part in the final finish. Apply as uniformly as possible and let dry. Once dry, sand or scrape down any high trowel or lap marks. Apply a second coat of Alto™ in one continuous application, corner to corner, again avoiding long repetitive trowel strokes. In the second coat 5-10% of the first coat should be left exposed in a random fashion. Stay away from anything resembling a pattern. Once second coat has dried for about 15 minutes, lightly spray with water and trowel down. VariStain™ may be applied during the water troweling process if a more aged mottled appearance is desired. 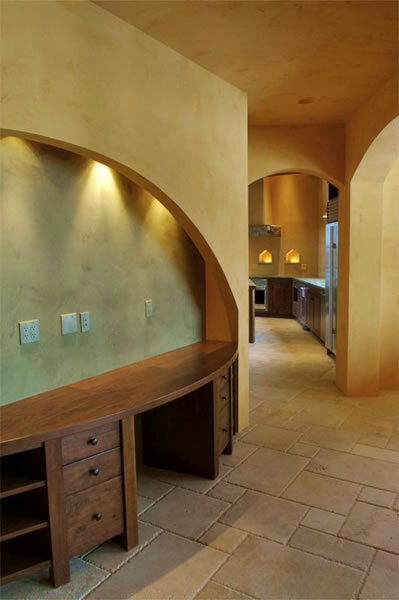 Alto™ is a 100% acrylic polymer based, crack resistant, sanded, trowel applied plaster finish. Alto™ may be used for interior or exterior applications over properly prepared substrates, including new or existing drywall. May also be applied over cement or gypsum base coats or existing plaster surfaces. Alto™ may be used as an exterior finish over properly prepared stucco basecoats. A reinforcing fiberglass mesh may be installed to minimize cracking. Colors: Alto™ is available in the 24 standard Variance colors or may be custom colored upon request.